The Rebel Sweetheart. 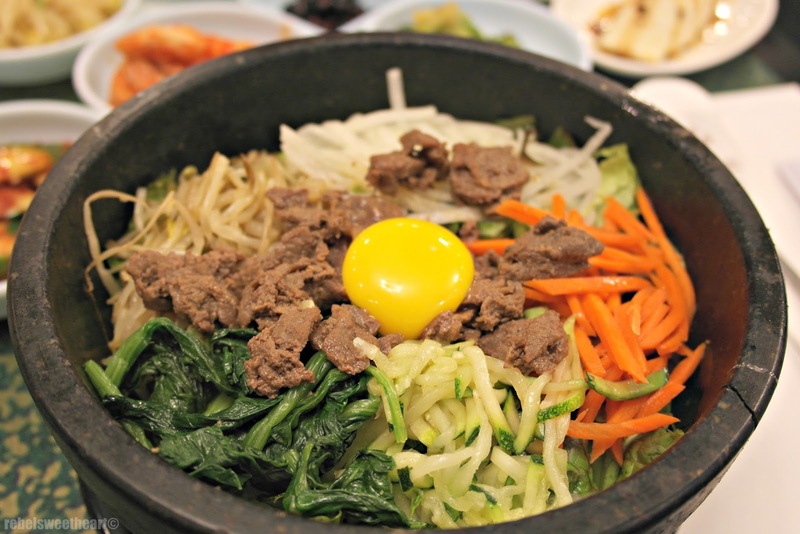 : Seoul Searching | Top 10 Must-Try Korean Food. For the most part of our two-week stay in Seoul, my Korean unni (my cousin-in-law's wife), would constantly tell me to eat as many and enjoy as much Korean food as I can because I will be missing them a lot when I come home to the Philippines. True enough, I've been craving for Korean dishes constantly. I miss Korea and its food so bad that it actually compelled me to write this post. Haha! They say Korean food is one of the healthiest on Earth, with much emphasis on vegetables, and with meat cooked simply and without much oil. 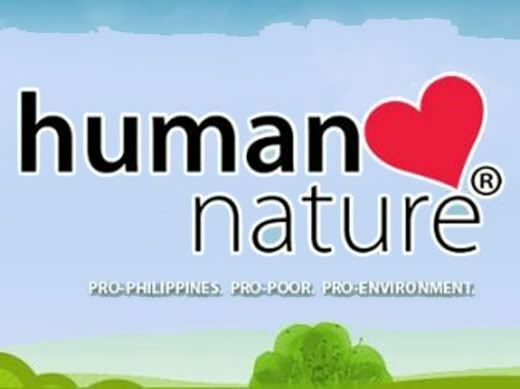 Similar to the Philippines, rice is also a staple food in Korea and is almost always present in a typical Korean meal. Likewise, soup and several side dishes are also part and parcel of a Korean meal spread. Below I have listed some of the Korean dishes that we enjoyed. In my opinion, they are the most delicious, and these are food that I know most foreigners would also love. 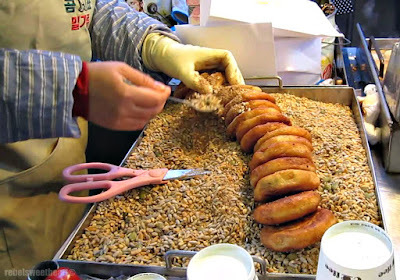 Pronounced as 'dok-bok-ee', it's one of the most popular street food in Korea. 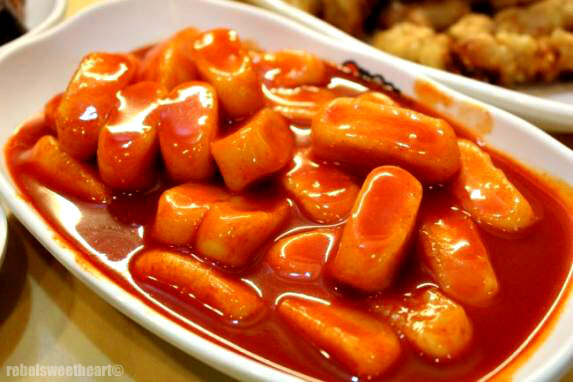 Usually sold by street vendors and at pojangmachas (you know, those tents where they drink soju in Korean dramas), it's a dish made by sauteing cylindrical rice cakes (called tteok) in red pepper paste (also known as gochujang). The sweet and spicy sauce combined with the chewy rice cakes can be simply addictive! Japchae, or Korean glass noodles, is a flavorful and nutritious dish that can be served as a banchan (side dish) or as the main meal. It's usually cooked by stir-frying in sesame oil and mixed with vegetables. The dish bears semblance to 'pancit' - a Filipino noodle dish. 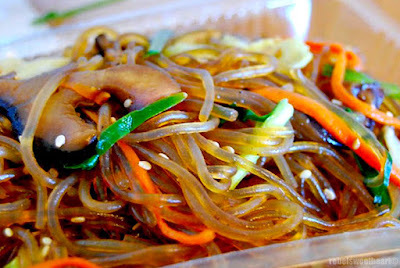 However, japchae uses sweet potato noodles called dangmyeon, which have a unique texture and don't feel heavy like rice or flour-based noodles. One of the most enjoyed delivery food in Korea, jjajangmyeon is a noodle dish of Chinese origin. 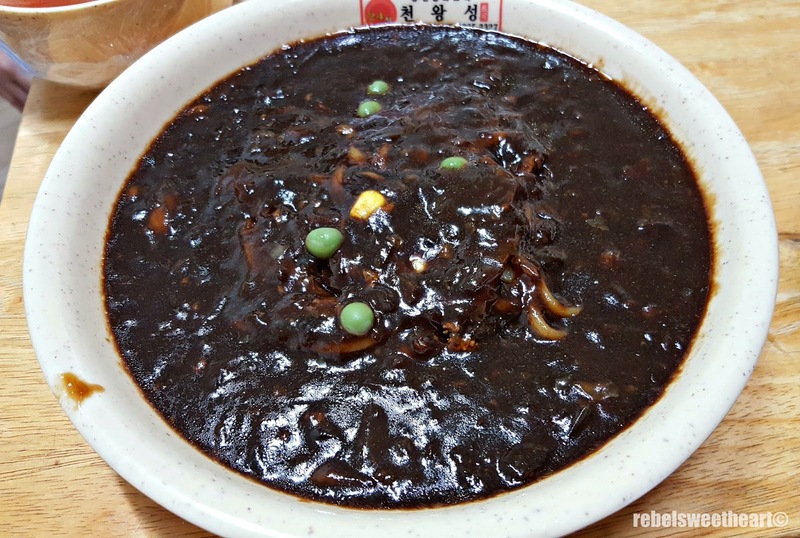 It's made with black bean sauce, pork and vegetables, and sometimes, seafood. The noodles are thick and made with wheat flour, while the sauce is made from roasted soybeans and caramel. This dish is best eaten with danmuji (yellow pickled radish) which usually comes for free with every delivery order. I have always been in awe of the intricacy of this dish whenever I see it on Korean dramas and Korean cooking shows. The ingredients are cooked individually, then beautifully arranged in a stone bowl called 'dolsot'. Really, it's a feast for both the eyes and the stomach. Bibimbap is a colorful medley of vegetables, beef, and rice, cooked with garlic and sesame oil, and topped with an egg yolk (sometimes a fried egg) and gochujang (Korean chili paste). The name 'bibimbap' literally means mixed rice, so yeah, you mix everything in the bowl before you eat it. Another popular street food, hotteok is a pancake traditionally filled with brown sugar, honey, peanuts, and cinnamon. These days, many variations of the hotteok have emerged such as the matcha (green tea) hotteok, bokbunja (raspberry) hotteok, and hobak (pumpkin) hotteok. 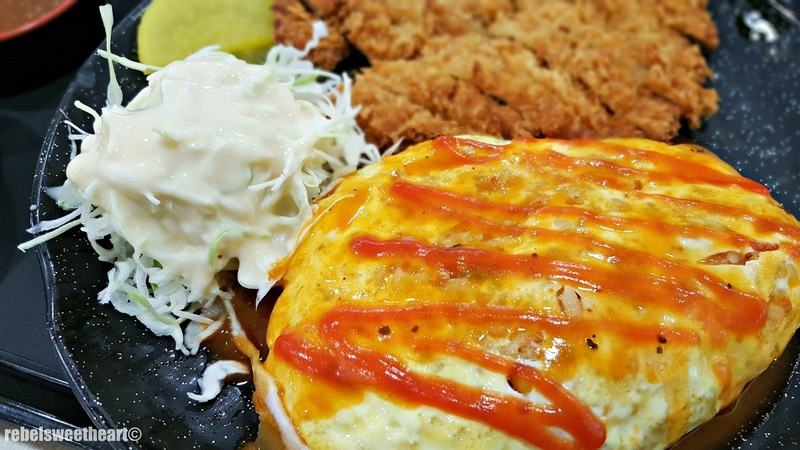 Originally from Japan, omurice was introduced in Korea during the Japanese Colonial Period. It has since become a popular and well-loved dish among Koreans, and has been made even popular across the globe, thanks to Korean dramas such as Rooftop Prince and Signal. Made with kimchi fried rice wrapped in scrambled eggs, it's one of the simplest yet most flavorful Korean fusion dishes that I have tried. Omurice (with tonkatsu on the side). Out of all the Korean street food that I have tried, bungeoppang is and will always be my favorite. It's a fish-shaped bread (bungeo means goldfish in Korean) filled with sweet red beans. 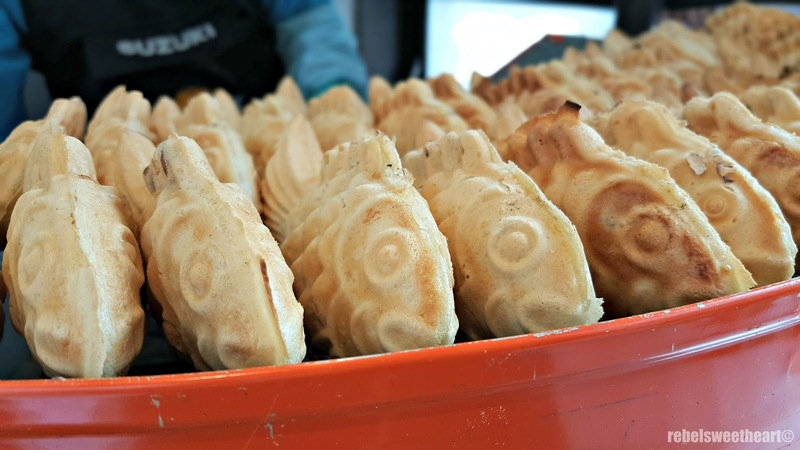 The bread is crunchy on the outside (I like nibbling on the tail and fins as they are the crunchiest parts), and the filling is sweet, but not cloyingly so. There's a bungeoppang stall near our place, and I go there almost every afternoon to buy 2000 won (approximately Php 79 or $2) worth of bungeoppang. That's eight pieces of bread, and you can even choose from the usual red bean filling or the cream filling. 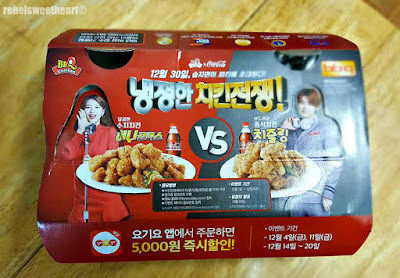 Both taste jjang! That's great in Korean! Forget KFC, Korea's yangnyeom tongdak (seasoned fried chicken) is now my favorite fried chicken in the world! Prepared in such a way that fat is retained on the skin, the result is a crust that's thin and crackly and meat that's soft and tender. The chicken is usually seasoned with spices, sugar, and salt prior to and after frying, thus making the dish very flavorful. Best served with mekju (beer)! 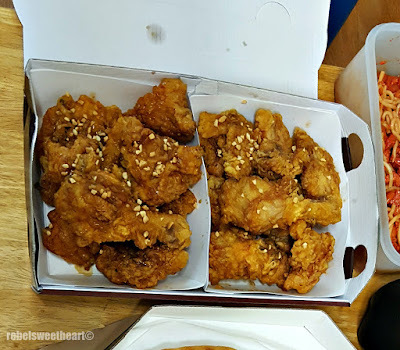 There are many fried chicken stores in Korea, but this one is my husband's favorite - BBQ Chicken! Gangjeong Chicken (glazed) on the left, Crispy Chicken on the right. 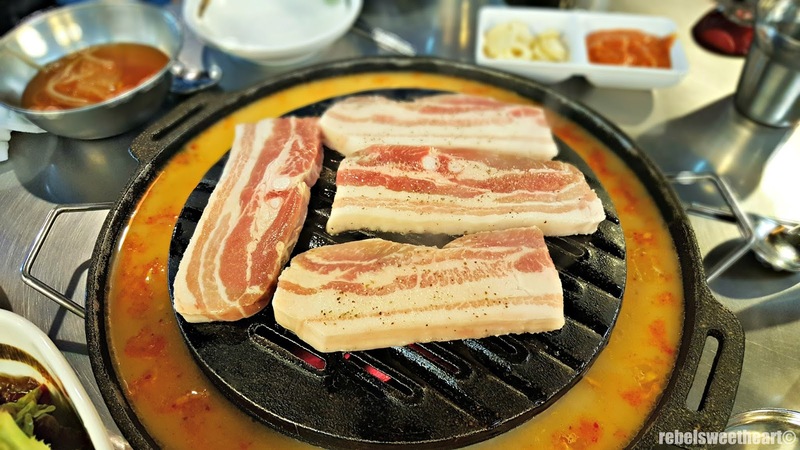 Next to kimchi, samgyeopsal or grilled pork belly is perhaps Korea's most popular dish. The name samgyeopsal literally means three (sam) layers (gyeop) of meat (sal). It's a table-cooked dish usually served with banchan (side dishes) and lots of vegetables. The best way to enjoy samgyeopsal is to place the meat inside a lettuce leaf together with cooked rice and vegetables, roll it, then dip it in sauce before popping it into your mouth. Best served with soju, too! Now this is the Korean dish that I miss the most. It's a spicy, stir-fried chicken dish made with boneless chicken pieces, cabbage, sweet potato, tteok (rice cakes), and other vegetables. I had the chance to try dak galbi during our visit to Nami Island, located in Gangwon province, where the dish originated. 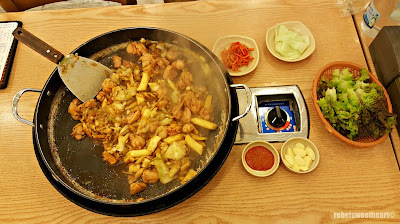 Like samgyeopsal, dak galbi is also a table-cooked dish, and is good for sharing. Dak galbi is typically not served with rice, but it’s customary to mix in some rice into the leftovers at the end to make fried rice. You have to order the rice separately, though. Dak galbi, I can't wait to eat you again! Ohh, I've made Bibimbap twice before. I just use a fried/over easy egg. It's delicious! I have never tried any of these, but the Hotteok. sounds delicious! Koreans sure love their chicken! MY favorites are always japchae and bibimbap! But I've never tasted the others on the list aside from those two and the omurice that my mom makes, so that's probably why. Kimchi is something I enjoy with rice and a fried egg though! I've eaten several of these many times, and have made bibimbap myself a handful of times, too. Now I want some Korean food---and I just had dinner! What a great list you have here! I love the look of the Bungeoppang. My kids would think it was awesome! Love all of them, so satisfying. Especially the 10th one! Glad you shared it. I have heard that Bibimbap is so tasty but have yet to try it myself.